TRUMP’S FOREIGN POLICY. In his inaugural speech he said that other countries were quite right to put their own interests first. Has any other US President in recent decades ever said that? The official site continues the echo of Adams’ policy to not go abroad to seek out monsters. All to the good – the world has suffered enough from the Exceptionalists – 26 thousand bombs in 2016. However, some things disturb me. I don’t like the hostility towards Iran from him and his team – Iran (much stronger today thanks to the inept machinations of Washington, by the way) may be a concern for Israel and Saudi Arabia, but it isn’t for us; to say Iran is “the foremost state sponsor of terrorism” while ISIS/Daesh is “the greatest threat globally” is not only idiotic but self-contradictory. Secondly, threats against China’s activity in the South China Sea are frivolous: in the final analysis there is nothing Washington can do about it short of a big war (which it would certainly lose) and no reason why it should. Finally, if he seeks a less interventionist foreign policy, why does he want even bigger armed forces? And, if, as some think, there is some notion of a Kissingerian separation of Russia and China, there will be disappointment. Xi Jinping recently emphasised the difference between China’s relations with the USA and with Russia: “We will strive to build new model of major country relations with the United States, a comprehensive strategic partnership of coordination with Russia…“. Lavrov reinforced it by saying he considered Russia-China relations as “a model for responsible major powers“. The situation was very different in 1972 and the intervening years have taught Beijing and Moscow to put little trust in Washington’s promises or capacity to carry them out. RUSSIAN HACKING. I hope – probably naively – that, now that it has failed in its purpose, we never hear anything more about this preposterous story. Although we do need serious investigations. FOR YOUR READING PLEASURE. The Neocon Lament: Nobody wants them in Trump’s Washington. MYSTERIOUS RUSSIA. Not the face you’d expect under a papakha, is it? 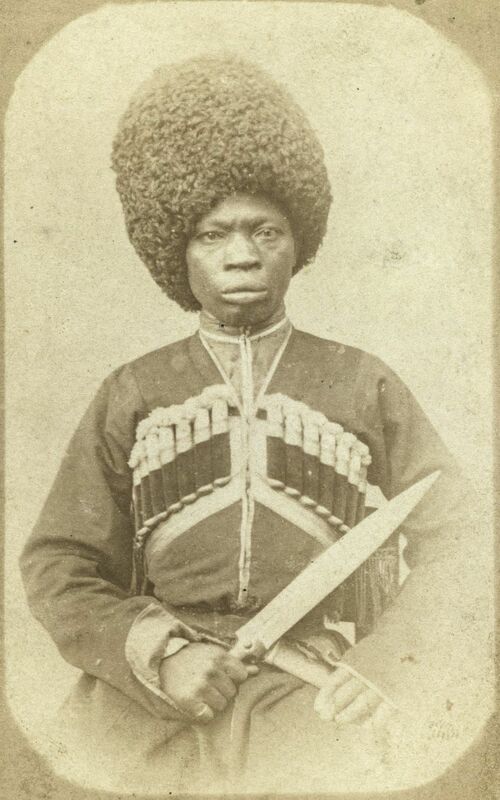 Wikipedia on African-Abkhazians. PUTIN’S RUSSIA LEGALISES DOMESTIC VIOLENCE!!!! Not really. RUSSIAN MPs IN ALEPPO. Interesting video – most are Chechens but all of them are Russians. In this respect – the distinction between русские and россияне, Русь and Россия – Russians are better heirs of the Roman Empire than we are. Note the first-rate equipment and air of soldierly competence. SYRIA. The Astana meeting, sponsored by Russia, Turkey and Iran, took place. Nothing was decided, but it was another step in a necessarily slow process. Some developments in identifying the non-jihadist opposition; Turkey further distanced itself from the USA; Iran made another advance in importance. Russian and Turkish aircraft have conducted joint operations. As an earnest of the paragraph in America First Foreign Policy on defeating ISIS, the Russians report the US passed target information to them. There is reason to believe that the US military will be happy to cooperate: “they know they are just training the next generation of jihadis“. Remember what Michael Flynn, then DIA head, now National Security Advisor, said. (Remember the flapdoodle when Trump called Obama the “founder” of ISIS? That’s what he meant.) Tulsi Gabbard has visited Syria – interviews here. SPEAKING OF WASHINGTON AND DAESH… “we were watching, we saw that DAESH was growing in strength, and we thought Assad was threatened… We could probably manage that Assad might then negotiate, but instead of negotiating he got Putin to support him.” And that’s after the US giving an “extraordinary amount of arms”. Kerry, thanks to Wikileaks at 22:25. Washington always thinks it can “manage that” and never does: a catastrophic record of self-deception and hypocrisy since 1979. MH17. Don’t try investigating or challenging the official story yourself, you’ll get into trouble. Trump himself is unconvinced. There’s a call for a new investigation. UKRAINE. Kiev had 460 troops killed in the Donbass last year – 55% from non-combat causes (63 of them ruled as suicides). Terrible morale. There’s a move to punish Pinchuk for daring to suggest it’s over. WESTERN VALUES™. The Director of Human Rights Watch has decided that Trump and the others revolting against the established order are “a new generation of authoritarian populists [that] seeks to overturn the concept of human rights protections”.